They can't get any worse. Or can they? If you have any better ideas. Send them to Bert's Secretary. As recently shown during an IEPG plenary the IETF is eating into its financial reserves. As the secretariat, insurances and the meetings are funded from meeting fees and as the secretariat has grown while the number of participants is going down the IETF is looking for methods to cut costs and increase revenues. Since the workload of the secretariat is related to the amount of Internet Drafts and since the shear amount of drafts is actually causing the IETF function less effectively Bert proposes a 'Draft Tax'. Every author of a draft pays a small amount, via Pay Pal, Credit Card or what have you, before an initial or or a new version of a draft is about to put in the document queue. The tax may actually make people think twice before submitting a draft or revision and act as a quality control trigger. Aha what the heck... just sign it. Suzanne Woolf suggested to have Bert sign the root. Given his well know status as geek, trusted person and his wide spread network he is in the position to do this. Bert signs the root (just follow this link) on a regular basis. The root key is signed by PGP and Bert's key can be found on keyservers. The RFC 1149 firewall addresses an important information security problem which is completely ignored by current products in this area. The firewalling problem has it's root in 'the 3D etherspace available to the carriers' [RFC1149]. Although the use of topology helps to prevent all sorts of collision problems, firewalling remains a problem because there is no single point of entrance into the domain. The solution works with an off-the-shelf PC running any BSD-like OS, provided it has been equipped with Bert's proprietary and patented security device, which uses a combination of (experimental) ICMP_TRIANGULATE packets and (field-proven) .30 caliber buckshot to decisively deal with any perimeter intrusion. Some research into the process of detecting whether or not the carrier is actually involved in an IP protocol exchange may still needed in the future. This should, however, become evident after the first field trials in populated areas are completed later this year . Cash flow by advertising and 'blackmail'. A helpful message with advertising instead of your browsers 'cannot find domain' error. And additionally, all mail with typos in the address field ---ok, not all just a specific but substantial subset of the typos--- will end up in the 'typo mailbox'. Per default wrongly addressed mail will be publicly available, except when a small service fee for removal is paid. This evil scheme can be implemented by an even more evil technical solution. 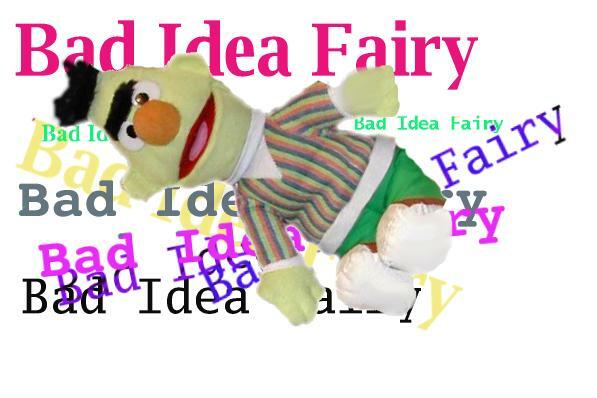 NOTE: This bad idea was published summer 2002 long before the IAB certified this as a bad idea..
People that have inspired or contributed to Bert's Bad Ideas prefer to remain anonymous.